This season, I’m doing things different with my public college basketball predictions. Usually, the public predictions page at The Power Rank has predictions based on team rankings, which take margin of victory in games and adjusts for strength of schedule. If you check out this page in the fall, you get these points based predictions for college football and the NFL. For college basketball, I’m offering a sample of predictions usually saved for members of The Power Rank. These predictions take the points based predictions and add components based on the markets and preseason expectations. This ensemble approach almost certainly leads to more accurate predictions. On the public part of my site, you will find a prediction for any game with a top 30 team by my numbers, as well as a random sample of other games. For example, here are some predictions for Tuesday, February 12th. Michigan will beat Penn State by 5.3 points on the road. Michigan has become a defensive juggernaut this season, as they rank 2nd when I take points per possession and adjust for schedule. Maryland will beat Purdue by 0.1 points at home. Purdue has won 8 straight games. But don’t count out Maryland, a talented team that ranks in the top 25 by both my points and market based metrics. Duke will beat Louisville by 6.1 points at home. Duke has shot 32% from three this season, but they almost doubled this rate (13 of 21) in beating Virginia Saturday night. They won’t shoot that well every game, but they should be the tourney favorite because of their future NBA talent. To check out all of today’s predictions, click here. Fresh predictions get posted every morning, so check out that link even if you’re reading this later. Back in 2015, Deflategate hit the NFL. Did deflated footballs give New England an advantage over Indianapolis in the AFC championship game? The number suggested yes. Warren Sharp looked at fumbles and showed that New England led the NFL over the previous 5 seasons. In this episode of The Football Analytics Show, I look back at the real insights from the fumble data in 2015. New England wasn’t an outlier in fumbles but another turnover metric. Now, we can look at four more years of fumble data. Did deflated footballs help New England reduce fumbles, an edge now gone? Or is there skill in fumbles, which will help New England in the Super Bowl against the Rams? To listen on Apple Podcasts, click here. To check out the Chase Stuart article on fumbles I discuss, click here. 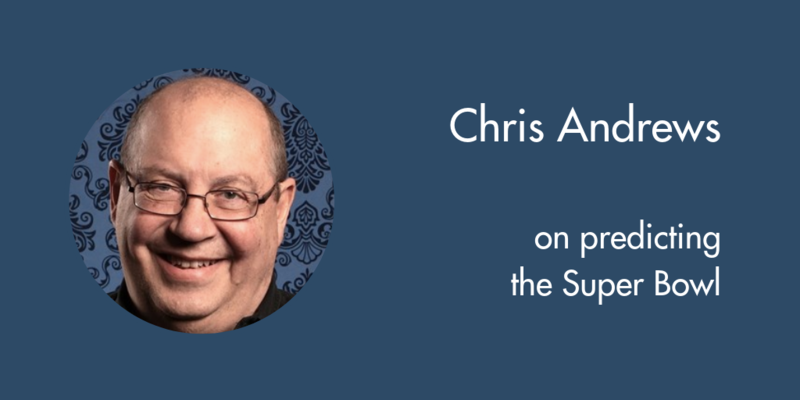 On this episode of The Football Analytics Show, Chris Andrews, director of the South Point sports book, joins me for a wide ranging discussion. I really enjoyed getting the bookmaker perspective, and I hope you do as well. In the past, I’ve looked how well NFL teams run the ball by yards per carry. I take the raw numbers and adjust for schedule with a least squares method. Here are the NFL rankings for rush defense through the 2019 Divisional Playoff games, which highlights the 4 remaining playoff teams. The number gives an expected yards per carry against an average offense, with an NFL average of 4.4 in 2018. New Orleans has the best rush defense in the NFL, while the other 3 playoff teams bring up the bottom of the NFL. My research suggests that yards per carry isn’t a great way to evaluate how well teams run the ball. Big plays can skew this metric. For example, suppose a team breaks off a 86 yard run, then gets stuffed for a 2 yard loss on the next 3 plays. 20 yards per carry seems awesome, but in this sequence the team had to settle for a field goal attempt. This season, I’ve started looking at rush defense by success rate. A rush is a success if it gains half the yards on 1st down, 70% of the yards on 2nd down, and all the necessary yards on 3rd and 4th down. In the four play sequence from above, the team had a 25% success rate. This rate better captures what happened on these 4 plays than the 20 yards per carry. After making schedule adjustments with a least squares method, here are rankings for rush defense by success rate. The number gives an expected success rate against an average NFL offense (41.7% average in 2018). These numbers tell a different story. The New Orleans rush defense is closer to average, and the Rams look respectable. The Chiefs are still dead last, which I believe will play a big role in their game against New England. Why should we believe success rate more than yards per carry? Bill Connelly did some excellent work with college football statistics to show success rate is more sticky from early to late season that explosiveness. His study inspired my interest in success rate. Dr. Ben Baldwin mentioned on my podcast that rushing success rate correlates to winning more than yards per carry. I hope to look into this more myself in the off season.